A great tool for social media engagement, Facebook claims to have a billion monthly active users (as of October 2012), making it one of the largest social networks in the world. Facebook offers several layers of public and private information depending on which features members use and on how members configure their privacy settings. Status update: Post to the Wall of a Page, the personal Timeline, or a Group using text, photos, videos, or links. Comment, Likes, and Shares: React to posts by clicking Like, posting a comment, or sharing the post. E-mail: Private message one individual or many Facebook friends. Pages and Groups are limited in terms of how they can message individuals to prevent spamming. Checkins: Use a smartphone to check into a Place on Facebook if a Page has been set up with an actual location, or to a Facebook public event within three hours of the event’s start time. Facebook chat: Instant message one individual or groups of people. If you’re using your personal Timeline on Facebook to market your business, you may be blurring the lines between your personal communications and business marketing. Facebook states in its Terms of Service that you cannot create a personal Timeline for a business and cannot use your personal Timeline for commercial purposes. We recommend that you create a Facebook Page for your professional presence on the network, and keep your personal Timeline, well, personal. Each person has a personal Timeline and a Facebook Page, and each person them in different ways. 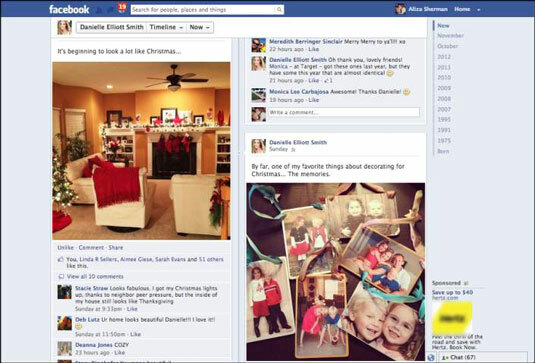 Danielle is comfortable using her personal Facebook Timeline to share images and news from her personal life with her Facebook friends. As a media personality, she is in the public eye, and a portion of her brand is about family. Still, she doesn’t accept friend requests from everyone who asks. Danielle maintains two separate Pages for both her main sites but dedicates the bulk of her attention to her personal Timeline because it integrates both sides of her brand. Danielle’s Page for her website, Extraordinary Mommy, centers on the content from her blog at ExtraordinaryMommy.com. Danielle’s company page, Danielle Smith Media, focuses on industry-related news — social media, media training, and video tips. Aliza joined Facebook before Pages were available, so she initially used her personal account as her professional Facebook presence. As more of her friends and family joined the network, she soon realized the value of using it to share more personal information; by that time, however, her Facebook friends consisted of many people she did not know personally. When Facebook introduced Pages, Aliza set one up to post her business news and technical tips. She finds it challenging to maintain both presences. Over time, she has tried to make her Timeline more personal and is now careful about accepting friend requests. How you use Facebook should be a combination of your personal preferences and best practices and an understanding of how others use Facebook and Facebook’s Terms of Service. You also have to consider the tools that Facebook provides for you to use, and how you use the components for engagement. Read and understand the Facebook Terms of Service. The site prohibits using a personal account or personal Timeline for commercial gain. The company created Facebook Pages to give businesspeople another option. Though many people violate these rules and haven’t gotten caught — yet — be wary of taking chances. Facebook has been known to close down personal accounts that violate its rules. Per Facebook: “You will not use your personal timeline for your own commercial gain (such as selling your status update to an advertiser).” Neither are you allowed to hold contests that require participants to use Facebook features as part of the contest.